I find that getting good card making ideas for men can sometimes be a little difficult. I love making pretty and cute cards that wouldn't appeal to most of the men in my life. Like many other crafting friends that I speak to, I sometimes struggle to come up with handmade card ideas for men. This simple Dad card I made for Father's Day has been a massive hit and one that works great other occasions like birthdays as well. 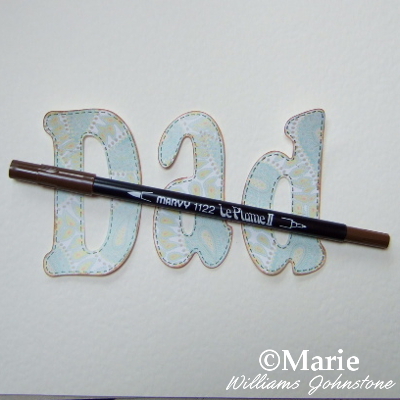 Although this particular alphabet design is clearly made just for Dad, you can use this same method to make up other patterns based on short words and text that will easily stretch across a blank greeting card front. Perfect for last minute makes! 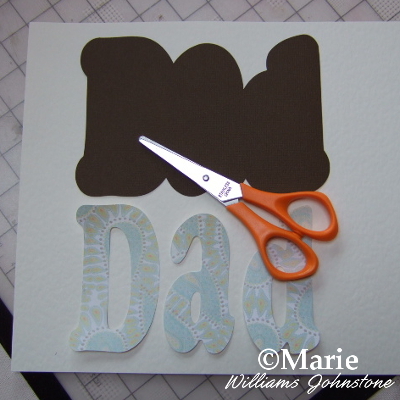 Making a last minute and quick card for Father's Day or your Dad's birthday doesn't need to be boring or hard. Use this simple idea as inspiration to make a fun card in next to no time at all. A blank greeting card. Alternatively, fold your own using a score board. Your choice of patterned paper and colored card. Scissors and adhesive such as glue pens. A fine tip marker pen. Small rubber stamp ink pad. Embellishments to finish off your design. You need the letters D a d in a large size of at least 4 inches or taller to work well for this method. You can print out letters very easily from any word processing package and help for this is given below, draw the letters out freehand which is fun if you are used to journaling, use a craft cutting machine like a Cricut or a craft stencil. Whichever method you use to get your Dad lettering, you need the letters to mostly fill the front of your greeting card blank. You may have a craft cutter machine such as a Cricut where you can cut out large letters very easily. However it is not necessary to have a cutting machine to create this very simple design. I made my letters using my cutting machine along with some patterned scrapbook paper. You can use any word processing program such as Word, Google Docs or Open Office to create your Dad lettering. You can even use a graphic design program such as Canva or PicMonkey. Open up your choice of program and type your Dad wording on a new page. You may need a space or two between each letter which will give you room to cut each one out when printed. Highlight the word and enlarge the font size so it fills over half the width of the page. 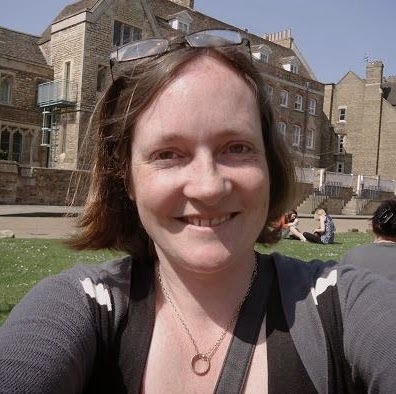 If the maximum shown size is not large enough, you can normally type in a larger size into a word processing program into the size box and press enter to apply. You can experiment with choosing a different style of font. Remember that whatever you pick, you need to easily be able to cut each letter out. You may need to experiment before you find the right size and style for printing and cutting. 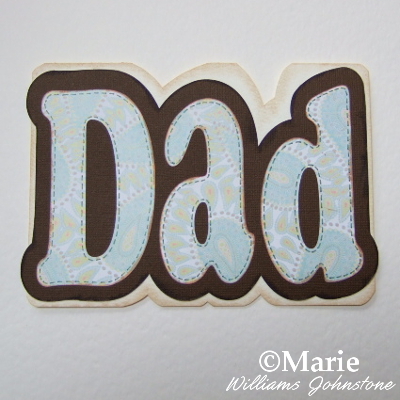 Once you are happy, print the letters out onto some card and cut them out to use as stencils for tracing around. Adults can cut out inner portions of lettering using a craft knife over a cutting mat. Once the individual letters were cut out, I used a mini rubber stamp ink pad to carefully apply some color around the edges of each letter. This technique stops the lettering from looking flat and it makes them pop out more when they are on the front of the card. To apply the ink, just lightly swipe the sides or edges of the paper gently with the surface of the ink pad. Allow the ink to dry or you may smear it over the paper. Glue the letters over the top of some solid color card. I used a dark brown Bazzill card which worked well for the whole look. Once stuck down, I drew and cut around the letters about half an inch away from all the edges to create a solid color and contrasting backing piece. You can see how these paper cut letters in this pastel blue and green pattern really pop against the solid chocolate-brown backing. A good contrast makes the letters really stand out more. I used the same inking method to edge around the brown backing card in a darker, black ink. Adding in detail makes handmade cards look more polished and professional. I love to add faux stitching around the inside edges of large lettering with a fine tipped marker pen. I used a Marvy Le Plume (Uchida) pen to make these hand-drawn stitch lines in a dark brown color. These particular double-ended pens can also be used for rubber stamping with instead of your regular ink pads. They are extremely versatile and that's why they are a favorite of mine to use. 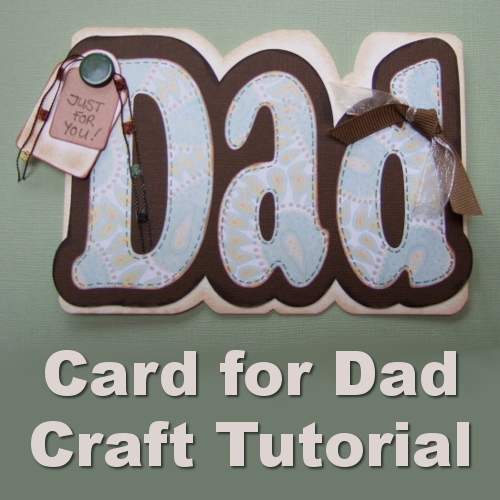 Stick the solid card backing with Dad on to the front of a blank greeting card. I chose a pale cream blank card which works well with all the colors I've used. The cream also provides a good contrast with the backing. 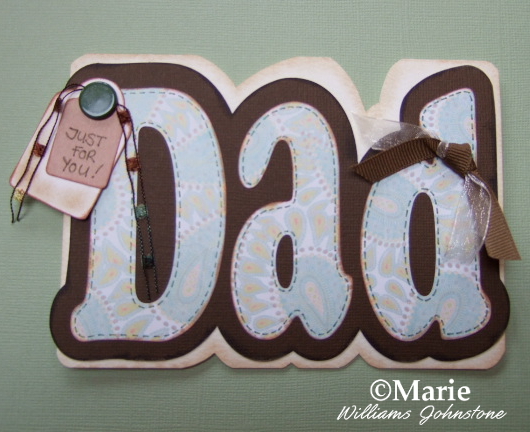 This particular Dad wording works best on a landscape or horizontal shaped card. However, you could use a tall card and have the text flowing downwards instead. I also carefully snipped out some small sections from the whole greeting card to mimic the outline of the wording. The additional snips make the front of the card a bit more interesting although you need to take care not to cut completely down the fold. Lastly I rubbed some brown craft chalk at the sides for a soft edge look. To stop the whole design from looking too flat, it's a good idea to add some extra detail by using embellishments. I chose a few little tags that are held in place with a brad. A couple of ribbons tied together add in some interest on the other side. This makes a fun and fairly simple card that you can make for the man in your life. 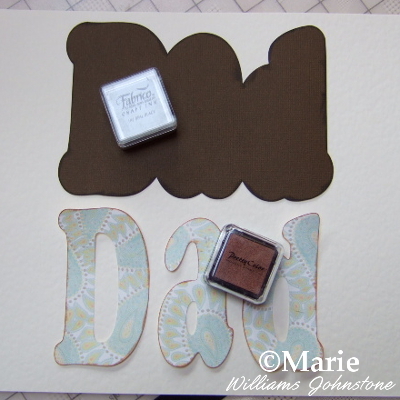 You can use this idea for Father's Day, Dad's birthday or for other times too. Change up the wording to suit many other occasions when you feel short of inspiration. Short words and sentiments can make some brilliant designs for greeting cards.